Kim Munley, wounded in the attack, exchanged fire with Hasan before her partner Mark Todd fired the shot which brought Hasan down. Nidal Malik Hasan (born September 8, 1970, age 39) is a Muslim and terrorist of Palestinian descent who shot 43 people at Fort Hood, Texas on November 5, 2009 in a Jihadist attack. Hasan, despite being a US army psychiatrist with a rank of major, is responsible for the most deadly terrorist attack on American soil since 9/11. Hasan "was forcefully opposed to the wars in Iraq and Afghanistan, was trying to elude his pending deployment to Afghanistan." He was born in Arlington, Virginia. Malik graduated from Virginia Tech University ('97) before joining the military. He received his medical degree from the Uniformed Services University of the Health Sciences (F. Edward Herbert School Of Medicine) in Bethesda, Md., in 2001. Malik completed a six-year residency in psychiatry at Walter Reed Army Medical Center in Washington, D. C., (2007), where he received a poor performance evaluation. He received his license in psychiatry on July 12, 2005. Apparently, there was no shortage of warning signs that Hasan identified more with Islamic Jihadists than he did with the US Army. From speeches, writings, conversations, affiliations and postings on Jihadist websites, there were more than enough dots to connect that should have exposed Hasan as someone inclined to attack innocent people in the furtherance of a political, religious and ideological agenda. There were more than enough red flags raised that, at a minimum, should have gotten Hasan kicked out of the Army. Kimberley Munley, a 34-year-old civilian police officer from Killeen, Texas and her partner, Mark Todd, confronted the Fort Hood shooter; Munley was outside directing traffic before the shooting. She was also hit by exchanged gunfire with Hasan. In August 2009, Malik Hasan purchased the two weapons that he used in the shooting. "He had people telling him on a daily basis the horrors that they saw over there." Malik's cousin, Nader Hasan. Malik was called "Camel Jockey" by his fellow soldiers. He was not in favor of U.S. wars in Muslim countries. Terry Lee, a retired colonel, cited an incident earlier this year as having had a big influence on Hasan – a fatal shooting at an army recruiting base in Little Rock, Arkansas. The suspect, Abdulhakim Mujahid Muhammad, faces trial for murder. Malik Hasan is reported to have stated: "In the Qu’ran, it says you are not supposed to have alliances with Jews or Christians, and if you are killed in the military fighting against Muslims, you will go to hell." Malik is single with no children, and also had an apartment in Killeen, Texas. Since September 2009, he attended the Islamic Community mosque of Greater Killeen. It is thought that due to the harassment Malik endured from his fellow soldiers, he may have had strong feelings of alienation. Virginia Tech University was the scene of the 2007 massacre by a student that left 32 dead. The Virginia Tech shooter, whose family was South Korean, may also have had problems with alienation. Fort Hood, with around 40,000 troops, had two soldiers stationed there that committed suicide in 2009—nine suicide cases since the US invasion of Iraq in 2003. It was named after Confederate General John Bell Hood. It is the biggest US military base in the world. On Nov. 12, 2009 Hasan was charged with 13 counts of premeditated murder in the military's legal system, making him eligible for the death penalty. It has not been decided whether to charge Hasan with a 14th count of murder related to the death of the unborn child of a pregnant shooting victim. Hasan's family asked John P. Galligan, a retired Army colonel, to represent him. ... the military should allow Muslim soldiers to be released as conscientious objectors instead of fighting in wars against other Muslims. (to increase troop morale and decrease adverse events). The title of Hasan's PowerPoint presentation was "The Koranic World View As It Relates to Muslims in the U.S. Military." It consisted of 50 slides. In one slide, Hasan described the presentation's objectives as identifying "what the Koran inculcates in the minds of Muslims and the potential implications this may have for the U.S. military." "If Muslim groups can convince Muslims that they are fighting for God against injustices of the 'infidels'; ie: enemies of Islam, then Muslims can become a potent adversary ie: suicide bombing, etc."... "We love death more than you love life!" Ibidem. The liberal media, looking to protect Democrats and Obama, sought to create sympathy for Hasan, shield him from the Islamic fundamentalism label. Instead, the MSM focused on Hasan as having 'pre- traumatic stress disorder' (the horrors of war he heard about), the treatment and name-calling he endured from fellow soldiers or being understanding of Hasan because didn't want to be deployed to fight other Muslims (he would never have seen combat if deployed). You would never know from listening to the liberal media or reading Wikipedia that Hasan caused the biggest terror attack on USA soil since 9/11. Terrorism and national security matters are still very much tied to Republicans, as Democrats fail time and time again to prove themselves tough on these issues. The liberal press initially hailed Kimberley Munley as having "brought down" Hasan, but it turned out that her male partner Mark Todd fired the decisive shot. In fact, after wounding Munley, the terrorist managed to reload his gun before Todd shot him. Hasan is listed on page 29 of the document "Thinking Anew – Security Priorities for the Next Administration." Hasan was an advisor in homeland security of Barack Obama's presidential transition team. Hasan is listed as a participant, though not a member, of several meetings in the George Washington University's Homeland Security Policy Institute's Presidential Transition Task Force. Dar al Hijrah Islamic Center. Hasan worshipped at the same mosque as two of the 9/11 terrorists. The London Sunday Telegraph reports he was at the Dar al-Hijrah mosque in Great Falls, Va. in 2001, which was led by the radical imam Anwar al-Awlaki. Hasan's family attended the Dar al Hijrah Islamic Center in Falls Church, Va., where Awlaki was preaching in 2001. Hasan's mother's funeral was held at the mosque on May 31, 2001, according to her obituary in the Roanoke Times newspaper, around the same time two 9/11 hijackers worshipped at the mosque and while Awlaki was preaching. The mosque is one of the largest on the East Coast of the USA. Two officials said the Washington-based task force was notified of communications between Hasan and a radical imam overseas. Imam Anwar al-Awlaki, who is now based in Yemen, preaches to US Muslims in online lectures. Profile of Major Nidal Malik Hasan. Fort Hood Massacre: Act of Terror or Horrific Crime? Nidal Malik Hasan, Suspected Fort Hood Shooter, Is Army Psychiatrist. 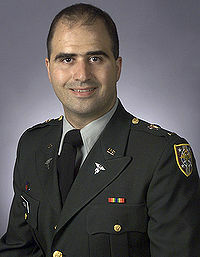 Nidal Malik Hasan, MD. Practitioner Information Website. Virginia Board of Medicine. Who is Maj. Nidal Malik Hasan? Profile: Major Nidal Malik Hasan. ↑ 2.0 2.1 2.2 God is great: Last words of Fort Hood gunman before being shot by police heroine. ↑ 7.0 7.1 Major Nidal Malik Hasan: Soldiers' psychiatrist who heard frontline stories. ↑ The Telegraph Online: "Fort Hood: The largest US military base in the world"
↑ Army: Fort Hood suspect charged with murder. ↑ Fort Hood suspect warned of threats within the ranks. ↑ Lawyer asks investigators not to question Hasan. ↑ AP Sources: Defense Dept worker looked into Hasan. ↑ Fort Hood shooting: Nidal Malik Hasan 'had contact with 9/11 imam'.